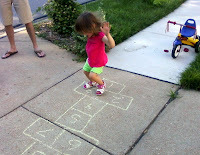 Today Mom and Liz taught Alyce a new game to play, Hopscotch. 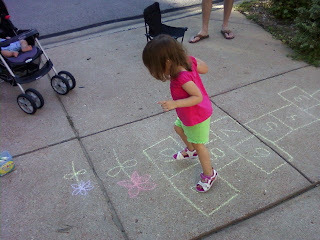 Liz drew the hopscotch track on the sidewalk with some chalk and showed Alyce how to jump on each of the squares. Well Alyce has the right idea even if her execution is a bit off. They were already in the throes of jumping by the time I got home from work so I missed the learning curve. Alyce was more than willing to show off her new skills provided someone counted for her.